So today I ran into an issue testing a RESTful service API. The API allows me to query a resource using GET and to provide a couple of optional parameters. I can provide these as either request parameters on the URI or as a JSON payload in the request body. Testing with a couple of REST client tools ( restclient and REST console) however failed. On further investigation it turns out that these tools are not packaging the JSON payload into the request body, presumably because it uses a GET rather than POST or PUT method. This made me wonder whether it was actually even legal to supply a message body with a GET request. A message-body MUST NOT be included in a request if the specification of the request method (section 5.1.1) does not allow sending an entity-body in requests. Which together suggest that when processing a GET request, a server is not required to examine anything other that the Request-URI and Host header field. In summary, the HTTP spec doesn’t prevent you from sending a message-body with GET but there is sufficient ambiguity that it wouldn’t surprise me if it was not supported by all servers. This entry was posted in REST and tagged #http, #oddity, #REST on Mar 27, 2013 by ScoobaDood. Last time I pointed out where you could download the various tools necessary to follow this tutorial. This time we’re going to make something happen. But first an overview of how Augmented Reality works. Augmented Reality is all about adding extra information to the raw data we collect through our senses to provide an enhanced or augmented view. Mostly this has meant visual information though there’s no reason why it couldn’t be audio. As an aside, Shazam is a great example of an audio based AR app, it ‘listens’ to music playing and then provides you with information about the artist and song. It’s not too hard to imagine this integrated with e.g. Google Glass to provide you with a ticker in the bottom of your field of view that constantly kept you updated on the background music to your life. 2. 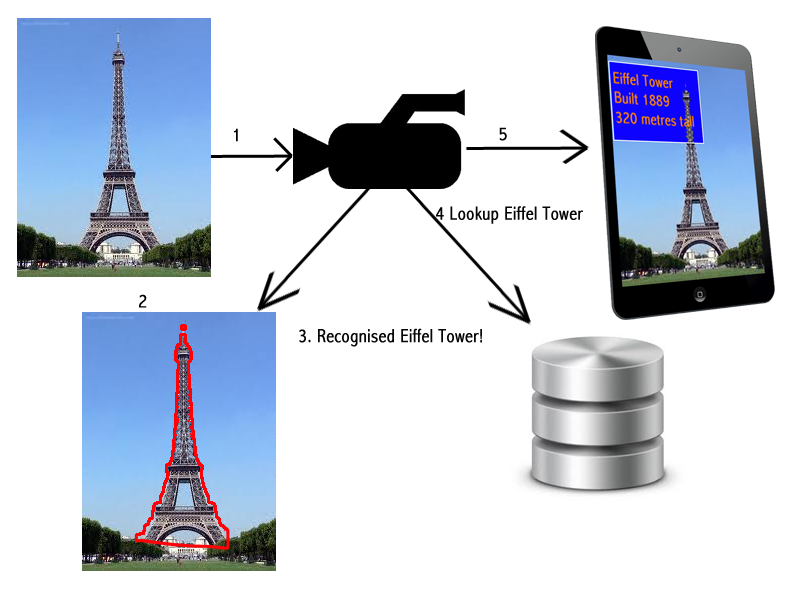 The AR examines the picture for some sort recognisable features – perhaps a face, a building, some text or something else. This can require some quite sophisticated image processing code. 5. Finally the app shows this picture to us on the screen of our AR device. If we can do this 30 times per second then we have a cool, immersive AR application. This layout simply defines a single view which will display the frames retrieved from the default camera. The main items to note from the layout is that we need to include a new namespace, xmlns:opencv="http://schemas.android.com/apk/res-auto" definition in order to use OpenCV components in layouts. We then go on to define a NativeCameraView. The line opencv:show_fps="true" will enable the view to automagically show the number of frames per second being processed which will give us a measure of how efficient our code is. Note also opencv:camera_id="any" which will cause the device to use the first camera it finds as the one to provide video frames. The camera_id could be set to be a specific ID on devices with multiple cameras. Within the manifest it is important to ensure that we have added the permission <uses-permission android:name="android.permission.CAMERA"/> to allow camera access. The Action code itself is worth walking through in some detail. Of these the only one were interested in is onCameraFrame which wil be called every time there is a new frame to process. This is described in more detail below. The camera view private CameraBridgeViewBase mOpenCvCameraView controls when camera can be enabled, processes the frame, calls external listeners to make any adjustments to the frame and then draws the resulting frame to the screen. This block of code is called before the Activity constructor is called. It’s basically some boilerplate to force the OpenCV library to load and initialise. The line mOpenCvCameraView.enableView(); enables the view so that it can start to capture and display frames from the camera. More will be said about this code later bit for the time being we will leave it at this. Once we get started and onCreate is called, we ensure that the screen is kept on and set up the layout. This code mOpenCvCameraView.setCvCameraViewListener(this); adds the Activity as a listener to the view. Each time that a frame is produced, our method onCameraFrame(CvCameraViewFrame inputFrame) will be called, giving us a chance to process the image and find any useful or augmentable objects in it before it’s displayed. This method is the guts of our AR capability. Here we are passed a copy of the frame and given an opportunity to process it before it’s displayed. We are expected to return a Mat instace which is an OPenCV matrix described here but is basically a matrix representing the image content. In his example we just return the RGB colour image as a matrix from the frame. We could equally have used the gray() method of CvCameraViewFrame to return a gray scale image. Once you’ve created this app, run it up on a device and test it. 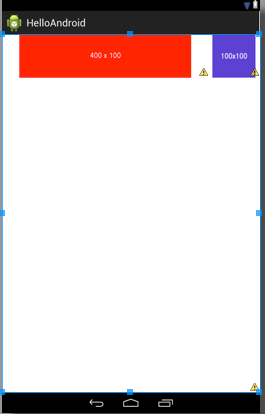 You should see the camera output being displayed in a the main window of your app. There’s no AR here yet but hopefully you can see how adding code to the onCameraFrame method will enable us to modify the displayed image, inserting our own text or objects. Next time, we’ll look at some simple image processing we can do to make this app ‘proper’ AR. This entry was posted in android, Augmented Reality, mobile development, OpenCV and tagged android, AR, OpenCV on Mar 21, 2013 by ScoobaDood. Augmented Reality, while it’s been around for many years, is grabbing the headlines at the moment, particularly due to the launch of the Google Glass project. In fact the earliest AR applications were probably Head-Up Displays in fighter plane cockpits. In fact as early as 1994, William Gibson wrote Virtual Light which features something awfully like the Google Glasses. R applications on android devices, partly to learn a thing or too myself (in anticipation of the day that Google Glass dev kits are available to people outside of the State) and partly to inspire others to do some cool stuff. I’m going to be building this tutorial using OpenCV for Android. Mostly because I’m already familiar with OpenCV so the learning curve wont be quite as steep but also because it’s a free opensource library with plenty of contributors and a lot of support if you (or I!) run into trouble. The device I’m using is the Nexus 7, principally because it’s so cheap and cheerful. The code should run on any device with a camera but I’ll leave it to you guys to test that. The NDK is a toolset that allows you to implement parts of your app using native-code languages such as C and C++. You will need to install this before you can start using OpenCV. Full directions are available here. OpenCV (Open Source Computer Vision Library) is an open source computer vision andmachine learning software library. It’s written in C and C++ but is also available with an Android/Java wrapper which is what we are going to use. You can get OpenCV for Android, along with installation instructions here. Once you have these two components installed you’re ready to start coding. This entry was posted in android, Augmented Reality, mobile development, OpenCV and tagged android, augmented reality, OpenCV, tutorial on Mar 21, 2013 by ScoobaDood. So today I’ve been wresting with Android layouts to try to achieve a pretty screen layout as part of a project for my Masters. What ought to be really easy given the pre-existing work from Java springs and struts, HTML and CSS as well as iPhone layouts turns out to be a complete pig. As an example, let me demonstrate the following. I have two images, one is 400×100 pixels and the other is a 100×100 square. 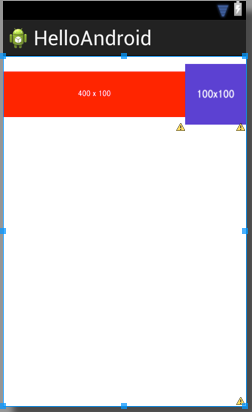 What I would like to do is to lay them out so that together, they fill the width of the screen, scaling both as necessary while preserving their aspect ratios. That is, the first should occupy 80% of the width and the second 20% of the width of the screen. The second should remain square. I want no padding, margins of other wasted space in this layout. 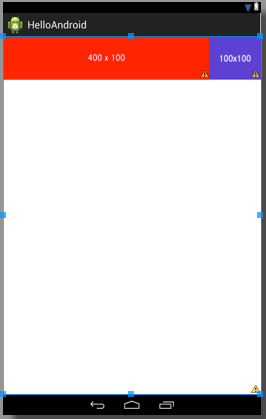 My first foray is to make a horizontal LinearLayout and allocate the appropriate weights to each. So, we know that the combined width of the two images should be 500 pixels. This is clearly bigger than the 480 pixels allowed on the Nexus 1 screen. So what I’d hoped would happen is that both images would be shrunk enough that they would fit the width. A quick calculation shows that this would mean the 100×100 image would be 96×96 and the 400×100 would be 384×96 pixels. This is not what has happened. 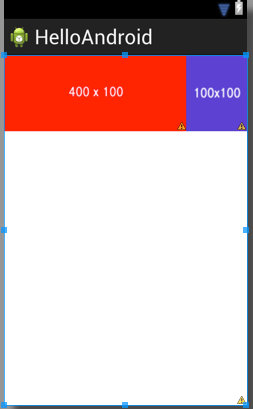 It looks as though the 100×100 image has been kept full size and then the 400×100 image has been shrunk to fit the remaining space. Odd! Let’s see what happens on the Nexus 7 with its 800×1280 screen. OK so here the images are spaced out sufficiently to occupy the width but haven’t been scaled up to fill the available space. further inspection of android documentation suggests that I ought to add some additional attributes to the images to force them to scale so let’s try that. On the N7 it doesnt look too bad, in fact it’s done precisely what I wanted it to. Hurrah! The images have scaled up to occupy the horizontal real-estate and have maintained their aspect ration. How does this look on the N1? Here’s how that looks on the N7. Hmmmm…The horizontal ratio between the views looks OK but it’s clear that right hand view hasn’t preserved the aspect ratio and again, the images haven’t resized. I’ve also tried to make 9patch images for these two images to get them to scale better but to no avail. It seems that as long as the image is set as the src, your choices are to scale it up to fill all the available space and crop it (which works for these images but not for any real image without a plain coloured background) or to scale only one dimension. Of course the problem here may be that I expect weights and scaling to apply equally well when I scale an image down as when I scale it up. Perhaps using an image that was smaller than the smallest screen width would be the way to go. Also, I know I can use the image as a background and without any scaling instruction whatsoever, it will expand to fit the available ImageView space but it doesn’t maintain the aspect ratio. Well, I’ve exhausted my energy here and may have to try to handle this in code. If anyone can shed some light on how to solve this problem (and judging by the threads on StackOverflow it’s not trivial) all help will be gladly received. This entry was posted in android, layouts, mobile development and tagged android, images, layout, mobile, multi-resolution, scaling on Mar 5, 2013 by ScoobaDood. This entry was posted in Uncategorized on Nov 28, 2012 by ScoobaDood. 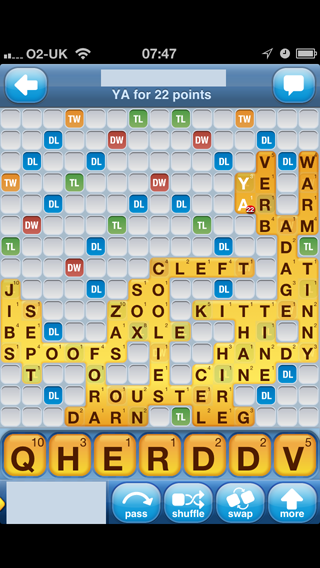 As promised yesterday, today I’m going to spend a little time describing how we parse out the Words with Friends board to work out what tiles have already been played. The screen shot contains a lot of detail but for the purposes of this post, we’re only interested in the playing area itself. While we could spend a lot of time using computer vision techniques to locate the main playing area, for example locating horizontal and vertical lines, looking for the corners of the playing area etc., it’s really not worth it because for a given device, the board is always in the same part of the image. If we can snapshot the image on iPad, iPhone 3, 4 and 5 then we can just count pixels to work out where the board is. We think of the board as being made up of a number of cells – 15 x 15 to be exact. A cell is just a spot where we can play a tile. The main things to note about cells is that they are square and that there are exactly 15 of them filling the width of the screen. This means we can work out how big they are by dividing the width of the snapshot image by 15. Once we’ve worked out these measurements, we can find the right part of the image for any given cell by simply using the offset from the top of the board area and adding in an appropriate X and Y offset based on the cell width. The next task is working out whether there is a tile played at a given cell or not. My first thought was that I could do this by looking for a mostly yellow cell at each location but there’s a problem with that. As mentioned yesterday there is a slight colour gradient across the board which means that tiles at the top of the board are a darker yellow than tiles in the middle of the board. Also, where a tile is played on a double or triple word or letter score, the colour of the underlying cell bleeds through. This means that a tile in the upper half of the board on a double word score (red) has pretty much exactly the same colour as an empty triple word score tile (orange). There are two important facts here. Firstly, we know exactly where we expect to find these cells on the board and secondly, the colour gradient used on the tiles is not used on the board cells. This means every TW cell is the same colour as every other TW cell. We first calculate the mean colour across each type of cell. You can see these colours here. Note that the colours are expressed in L*a*b* rather than the normal RGB triplets which is why there are negative values. Now when we look at a cell on the board, we can calculate the average colour across that cell and if it differs from the expected values by more than some threshold (I use 10%) then we assume that it has a tile on it. Once we have the locations of each tile, we can extract that cell and do some further image processing to work out what the letter on that tile is. First I take the grey scale version of the tile and then threshold using Otsu’s method. This gives me a black and white version of the tile. From here, I calculate the bounding box of the letter itself (i.e. tripping out the score in the corner of the tile) before trying to recognise the letter. OCR in general can be difficult and expensive however in this case, we have a very limited domain. There are only 26 letters to recognise and they are all positioned in the same way within a cell give or take a pixel or two. This paper describes a set of 16 different measurements that can be made across a set of letters from a font to distinguish between them. I use these measurements, normalised to percentages, to build a descriptor of each possible letter A-Z and then or each tile in the space, I compare to the stored descriptor, calculating the Euclidean distance from each to select the nearest neighbour. This gives pretty fair, though not perfect results as seen yesterday. 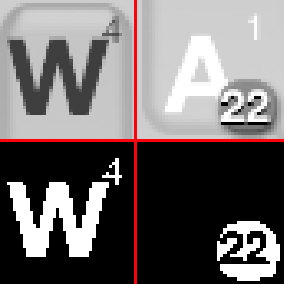 One of the key problems is with the letter W. As you can see from the processing of that tile, the score in the corner of the tile actually merges with the letter itself in the processed tile. This may be making it more difficult to recognise. Similarly, the red circle containing the score of the last turn played can also corrupt the letter on a tile making it hard to recognise. The next step is to improve the pre-processing of tile images to hopefully get better recognition. I’m going to attempt to improve these results by trying to tidy up the source images a little. This entry was posted in Cheats With Friends and tagged iPhone Development, OCR, Words with Friends on Oct 2, 2012 by ScoobaDood. My board parser produces the following output. Now there are a couple of mistakes here where letters have been mis-recognised and more worryingly, there are a couple of spots where the code hasn’t even worked out that there is a tile present. Nevertheless, for a simple algorithm I’m pretty happy with this as a first pass! Obviously I’m going to revisit the OCR code and train on more board positions (I only trained on 8 boards to get this level of recognition) but I think this validates the basic approach. 1. Getting rid of the red circle with the score in it. This is definitely corrupting my character recognition. You can see the mis-recognised A was marred by the score. 2. If you kind of squint at the screen, you’ll see that there’s a colour gradient across the tiles. Tiles at the very top and bottom of the screen are darker yellow while tiles in the central band of the board are much lighter. Since my tile recogniser relies on detecting colours, it may be the paleness of these central tiles that’s causing them not to be detected. Anyway, it’s late now so I’m off to bed but will post a much more detailed description of the algorithms used to find tiles and recognise letters tomorrow. For those of you who can’t wait, you might like to sneak a peek at Peter Frey and David Slate’s paper, Letter Recognition Using Holland-Style Adaptive Classifiers. This entry was posted in Cheats With Friends and tagged Image Processing, iPhone Development, OCR, Words with Friends on Oct 1, 2012 by ScoobaDood.